High blood pressure is also known as hypertension, and in the majority of cases symptoms don’t show. Regularly having your blood pressure checked and recognising the symptoms that can occur can help you avoid the development of serious health complications, such as a heart attack. One way to prevent the condition developing in the first place and to control it is to eat the right foods and avoid the wrong ones. 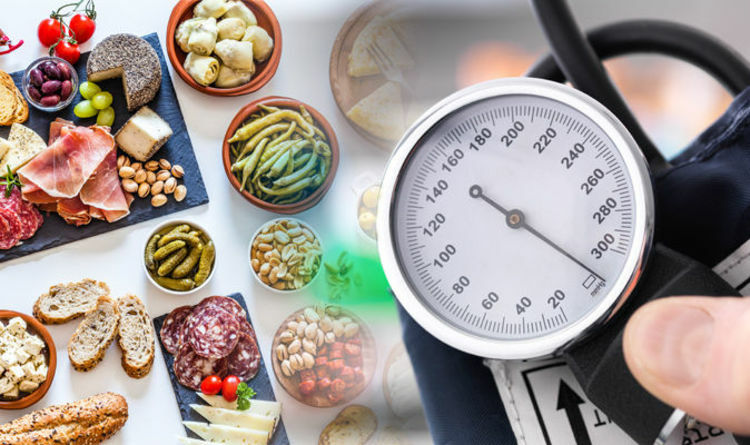 Salt and salty foods should be limited in any healthy, balanced diet, but there are seven foods that might surprise you with their salt content, according to the British Heart Foundation. Adding extras after cooking can not only add calories and saturated fat, but also salt, says the charity. Sauces, such as ketchup, can add flavour to your meals but are often high in salt. Spreading fats like margarine can contain added salt, so it’s advised you read the nutritional information on the label. Capers, anchovies and olives will likely add salt to food. It recommends: “Using non-salty flavourings is a better way to keep the taste up when you are cutting down on salt. Herbs, spices, lemon, garlic and black pepper are all good choices. Salt is often added to dough or sprinkled on top of a freshly baked loaf. The addition of olives in some bread can also spell trouble. Be wary of potatoes when eating out. Jacket potatoes may have been rubbed with salt before making or salt may have been sprinkled on chips before being served to you. A salted caramel cupcake may sound and taste delicious but this is an example of adding salt in something that was previously salt-free. So what is considered a normal blood pressure reading? NHS Choices advises that blood pressure is recorded with two numbers.